As Joe Hockey rose to his feet in the House of Representatives to launch the Abbott Government’s second budget for 2015/16, shipbuilders in Melbourne were informed by BAE Systems that another 80 permanent skilled jobs were being made redundant. BAE has now gone from a workforce of 1300 to only 800. Bill Saltzer, head of BAE Systems, recently told the Senate; ‘There has been no significant action to stem the loss of jobs and capability in this industry’. Yesterday’s budget hasn’t changed that sad fact. We will have to wait until at least August 2015 and the release of the next Defence White Paper to discover what the Abbott Government strategic guidance is for our national defence, ADF modernisation, defence industry and a much-awaited new Defence Capability Plan. That will be two years into a three-year term. Alas, the story of the Abbott Government in defence policy has been one punctuated by muscular proclamations but lacking any meaningful detail, and enthusiastic allocation of blame without accepting any responsibility. Instead, our Defence Ministers (two in two years) and defence leaders have had to cope with a Prime Minister whose interest in defence policy has manifested itself in eccentric interventions in acquisition policy and Captain’s picks (Japanese submarines), adventurist proposals for ADF deployments (Luhansk and Donetsk in the eastern Ukraine), and pet projects (converting our LHDs into mini-aircraft carriers). Proving the adage that a little knowledge is a dangerous thing. When Labor left office, Defence spending was at 1.71% of GDP. Both Labor and the Coalition have pledged to achieve 2%; Labor when financially responsible to do so, and the Coalition by 2023. Yesterday’s short-sighted Budget will see Defence spending fall by over 0.1% of GDP in 2016–17, despite Tony Abbott’s promise to increase spending to 2% of GDP. This represents a cut to Defence funding by over $1 billion in 2016–17. The short-lived increase in the defence budget for 2015/16 reflects the cost of military operations, the impact of the falling Australian dollar, and the costs of changed superannuation arrangements. On this basis, it is not clear that there exists a credible pathway to the 2% of GDP under the Abbott Government. Further, 1,150 APS jobs will disappear from the department of Defence in 2015/16. This is in addition to the 2,400 defence civilian jobs that have already been slashed. The First Principles Review has made the point that civilian cuts in defence are hurting capability and the capacity of the department to undertake the tasks required of it. The last two years of paralysis in defence policy has had a deep impact, most notably in our national shipbuilding industry. Our shipbuilders are now in the ‘Valley of Death’, and we are haemorrhaging industry capability and skilled jobs. Labor planned to bridge the ‘Valley of Death’ by having replacement Navy supply ships built in our shipyards. Tony Abbott killed that plan shortly after winning the 2013 election. This Budget is all about saving Tony Abbott and Joe Hockey’s jobs at the expense of Defence jobs and jobs in Australia’s Defence industries. Eighteen months ago the Abbott Government was elected with a promise to keep Australian shipyards busy building the warships that everybody agrees Australia needs. The Government has already put thousands of jobs at risk with its broken promise on submarines and with decisions to send the contracts for Navy’s two new supply ships offshore. The Abbott Government has sought to fill the defence policy vacuum with blame and partisan politics. It is now a ritual for the Abbott Government to denounce the shipbuilding industry for poor productivity, as a sorry substitute for taking responsibility or action. 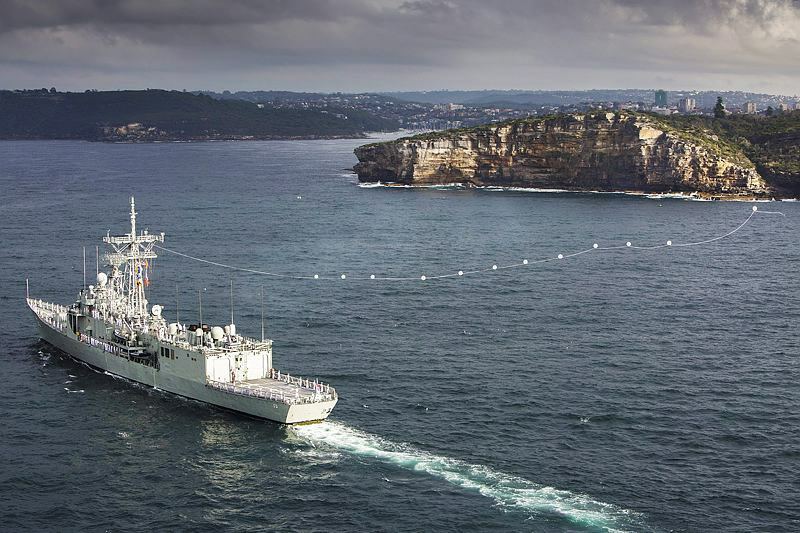 What Australia urgently requires is a long-term, rational shipbuilding plan to preserve an important national strategic capability, as well as the jobs, investment and industry that come with it. The real risk right now is that by the time the SEA 5000 and SEA 1000 projects come online, the Australian shipbuilding industry will no longer exist with sufficient mass and skills to undertake them. And then the Abbott Government will have delivered us a self-fulfilling prophecy. On a final note, the Australian defence and strategic community should be concerned at the dramatic withering of our foreign aid, cut by another $1 billion in the 2015/16 budget, with cuts now totalling $11.3 billion since 2013. Australia’s aid budget has now shrunk to 18 cents in every $100 of our national income—the lowest ever. The 20% cut to our foreign aid budget means a reduced capacity for Australia to shape our strategic environment. The Philippines, Indonesia, Vietnam, Laos and Myanmar have all had their aid cut by 40%. This at a time when the US is undertaking a ‘rebalance’ to the Asia-Pacific, and we are witnessing nontraditional external actors building their foreign policy footprint in the South Pacific with boosted aid budgets, generous loans and ever-growing embassies and consulates. This Budget is the latest chapter in a long running saga of broken promises, cuts and job losses in Defence—all of which are focussed on defending Tony Abbott’s job and not about defending Australia.